As a rank amateur in NCCC I enjoy myself as a Beyond Beginner Quilter. 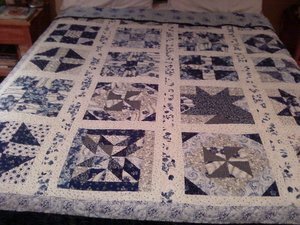 Making quilts is what I always wanted to do but because I don’t always know what I want to do next, I have discovered there are many ways to find out what next might be; one way is often by making a quilt, another can be seeing something new to me in quilting. 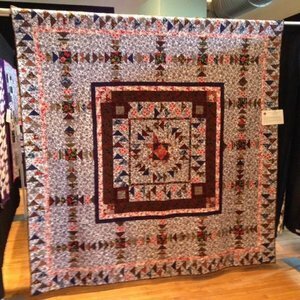 Some quilters take a path of craft, others a path of art; quilting lets me spend time on one path, then move to the other; then when I come to the intersection of craft and art, I hope I have created a piece of beauty and utility. I enjoy making quilts large and small, taking something new to me and something leftover from an earlier piece, trying to put them together in an original way, perhaps by using a pattern, technique, or model that I have used before, or, trying one I just learned, heard, or read about. As I work, I try to focus on the recipient or a person I simply think of as the ultimate user or viewer of the piece. I’ve learned from some really talented people like Jeanne Benson who teaches classes on the Mall in Washington at the Smithsonian, Barbara Dann in Emmittsburg MD when the Mid-Atlantic Quilters “go back to school” on a summer weekend, and at area quilt shops and the NCCC meetings where NCCC members and professional speakers teach a class for a morning or an entire day, or give a ½ hour demonstration at a regular monthly meeting, solving a problem I have or sending me off in a new direction. Making a quilt is a pleasure I hope I to enjoy for many more years while I enjoy the company of like-minded people along the way. If life is a journey, a pretty quilt can be a song you leave behind, a tune you’ve learned, that you can hum from memory as you move on to the next thing. Happy quilting! A quilt that grew! 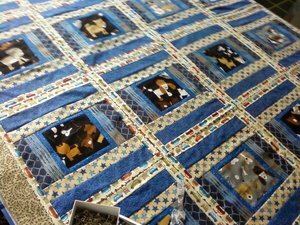 Started at a local quilting weekend, by the time it was in the guild quilt show, it was for a queen-size bed. I liked the serendipity of making it - and my husband likes the result! I like exploring new designs with baby quilts. There is often a little humor in the prints, and laughing helps me get over the bumps and the not-so-straight lines I sometimes create, despite my best efforts. Contributing a square to the guild raffle quilt was the inspiration for this quilt, where I used the scrappy technique to elaborate on several of the designs so beautifully presented in the guild's red and white raffle quilt. I'd say, neither is quilting, and often the more beautiful for it!